You asked for it, you got it. Jared’s first St. Louis adventure was so good that it deserved a sequel, this time with the full dose of ‘clog representing. A must for our trip was a visit to the Anheuser-Bush Brewery. Looking for a restaurant to Panclog beforehand, Jared’s uncle Marc suggested we give Benton Park Cafe a try. So we did! Benton Park is located at 1900 Arsenal Street, just across I-55 from Anheuser-Busch. They’re open until 10:00 PM Sunday through Thursday, and open 24 hours Friday & Saturday. More info can be found on their website, as well as on their Facebook and Twitter pages. Location/Environment: Given its location, we’re almost positive we’re not the first to pair Benton Park with a Bud tour. Breakfast and beer is the start to a pretty alright day. Parking was not an issue upon our visit. Street parking is plentiful at the cafe’s intersection. As you enter, local art covers the cafe’s interior. It’s a friendly, calming atmosphere. Sincere and casual. Service: For an early Saturday breakfast, service was adequate. We got the impression that fast service might be an issue at busier times. Coffee and drink orders were taken and delivered promptly. Once service was established it was consistent. None of us waited too long without a drink refill or check-in. At times, most notably towards the end of our meal, staff was almost too persistent in making sure we were OK. However, if this is our biggest critique, we’re doing alright. Menu/Selection: Benton Park has a good menu selection — a nice array of options — particularly for a cafe open 24 hours on Fridays and Saturdays. It’s almost a guarantee everyone in your party will be able to find something they’ll like. Customers are given the usual breakfast options, as well as the opportunity to create their own omelet, burrito or breakfast pizza. The cafe also features a full coffee bar. Complimentary waters are served with a slice of cucumber, which is a fresh change to the common lemon. Check out their full menu, as well as the boasted catering menu. I have always been a big fan of breakfast pizza. They have been hard to find in restaurants ever since the Breakfast Pizza Famine of 1997. Times are tough guys. Its hard out here for a breakfast pizza. If you ever see a breakfast pizza in its natural environment. EAT IT! This was a Meat Pizza. 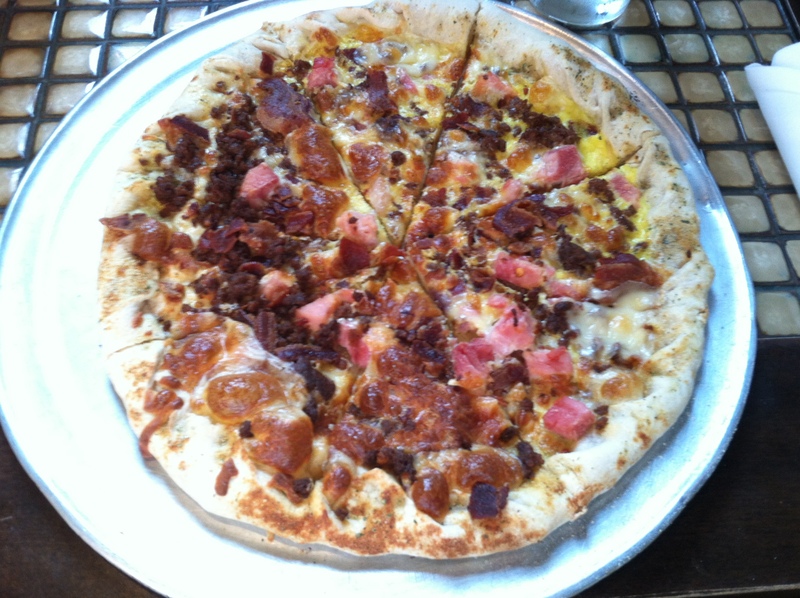 It enabled your mouth to taste herb-y crust, eggs, cheese, chorizo, sausage, ham, and bacon all in one meal. It was quite tasty. Due to its large size, I would recommend splitting the pizza with any partner you may have. This meal was great, but I still missed the sweetness of my usual breakfast meals. At $12.95 this pizza is a bit steep for 1 person. But it is worth it if you have a friend who likes eating. The Chai Tea Latte was the perfect drink for early in the morn. It had the enjoyable rich tastes of cinnamon and other spices. So all of my dining buddies drank approximately half of my glass. I still love them. As expected, I ordered the standard French toast per usual. 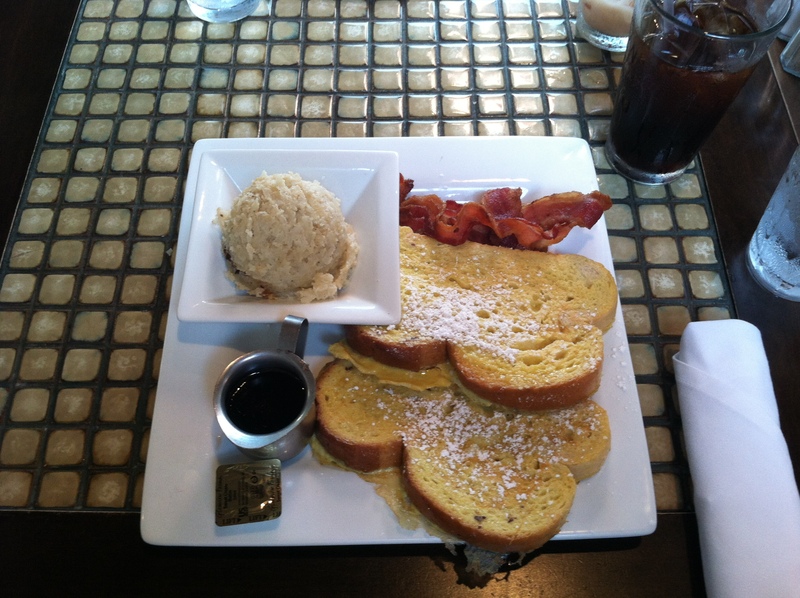 I actually think Benton Park’s French toast is a good barometer for judging most French toasts. It’s a very middle-of-the-road, basic griddle option. The two slices were very eggy. The edges were encrusted with a thick yellow brim of batter, per usual with French toast, but it was a complete circle around the bread. Almost like a mote of egg to keep invading enemies off the surface of the bread. Protective for sure, but lacking a bit of flavor. If I had one main critique of the meal, it would be that it was overall a little bland. Not bad, just lacking something. It was smooth and creamy, but lacking a striking note of flavor. At $7.95, you get pretty good value out of your meal. My plate seemed to cool rather quickly, cold before I was even close to finishing my meal. However, I think this was mostly due to the overhead fans in the cafe, as well as overall temperature, rather than the food’s freshness. The bacon and iced coffee quenched both of my respective cravings. The iced coffee was notably bitter and stark, not something to mess around with, but appreciated one-hundred percent. My meal also came with the choice of fruit or loaded potatoes. I chose the potatoes, which I shared with the table. Price: Prices are your average fair for an eatery of its kind. Most items are quite reasonable. 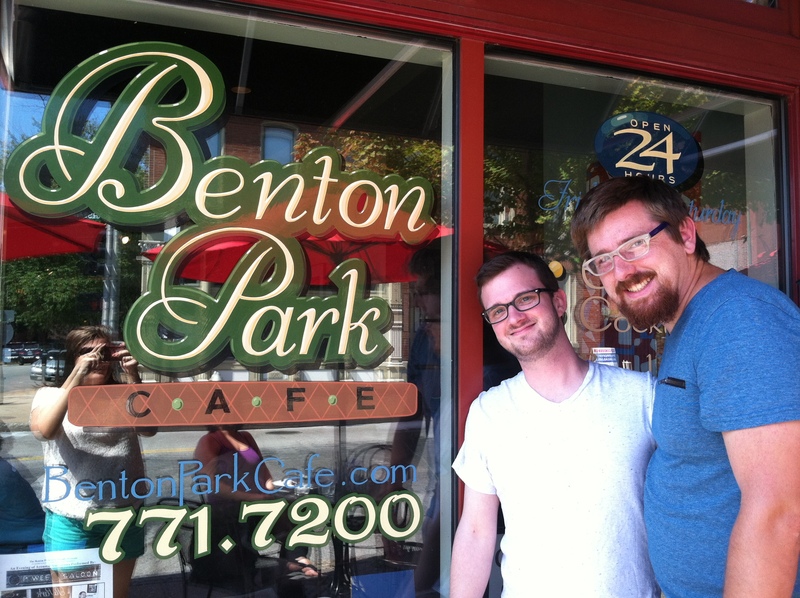 Overall: Benton Park is worth a visit, if for the relaxing, soothing vibe alone. The staff is friendly and helpful. The food is customizeable to your liking. The pluses far outweigh the minuses.